Applied lip bottles are generally older than tooled lip bottles, but many exceptions occur (e.g. the "sheared" and tooled lips described later). 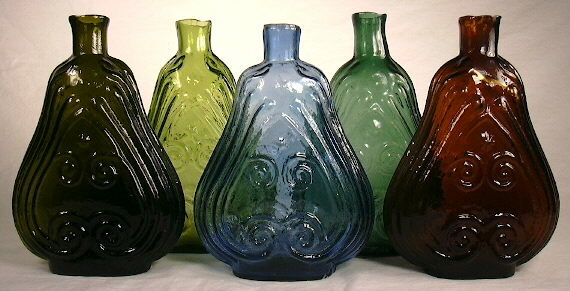 Applied lips on American made bottles generally date before 1885 and by 1890 molded and tooled finishes dominated. (Note: Many foreign bottles had true applied lips until the second decade of the 20th century). A glob top or globby top is a western American reference to a true applied lip and is referring to the excess glass run-over below the lip. It is most often used in reference to the older Western whiskey bottles. 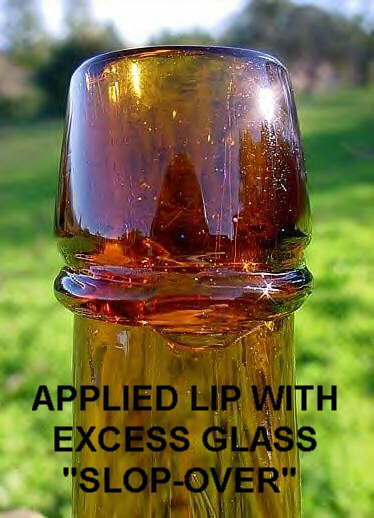 Click on thumbnail to the right for a larger picture of an applied lip on a Western whiskey bottle. With many bottles that chronologically overlap the two application methods - applied lip & tooled lip - the true applied lip bottle is almost always more desirable than the tooled lip version - Western whiskeys being a prime example. Be aware that the term "applied lip" is often also used by many collectors as a generic term for a non-machine made bottle (i.e. non-ABM), embracing both true applied lips and molded & tooled lip. Note: The term finish is more accurate than lip as it was the term used by glassmakers themselves because the creation of the lip was the finishing step in manufacturing a bottle during the mouth-blown or hand-made bottle making era (generally pre-World War 1). The terms lip and finish are used interchangeably here however. Sheared Lip or Finish: A "sheared lip" is pretty much as the term implies - a lip or finish that was cut off from the blowpipe leaving the upper end of the neck (opening) with an relatively abrupt end. The bottle opening was usually re-fired, tooled and/or formed into something corkable with various types of glassmaker tools. Sometimes the sheared lip will be flared out some. Many 1815-1860 era historical/pictorial flasks have "sheared" and tooled lips and the side mold seam will also often disappear somewhere below the top because of the smoothing effects of the lipping tools. The picture to the left shows a sheared lip on an early Pittsburgh, PA. flask. Many so-called "sheared lip" bottles were actually broken off (i.e. "cracked-off") from the blowpipe. If not re-fired and smoothed after the blow-pipe removal, the lip can have the appearance of chipping that is entirely in making. The left and middle scroll flasks at the top of the page have cracked-off finishes or lips. Unless significant chipping has occurred the value of a bottle with a cracked-off finish is not affected. Pontil Mark or Scars: Pontil scars can be broken down into numerous sub-types, but there is only a few major variations on the pontil theme. All styles date an American bottle from the American Civil War or before, though there are exceptions, but not many. 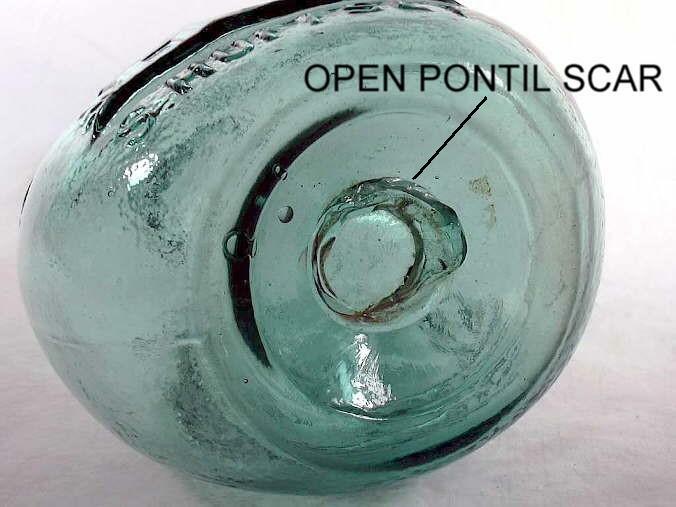 An open pontil (aka glass tipped pontil) is a sharp, often concentric, glass mark on the base of a bottle where a rod was attached that allowed the bottle to be held from the bottom, while the lip was applied and tooled. A very desirable attribute all things considered, e.g. a colored umbrella ink with a pontil is usually worth 2-3 times more than a smooth base version. Open pontils come in two variations - an "iron bar" pontil, which is a generally round though diffuse, and a "blowpipe" pontil, which is distinctly round and sharp. Click on thumbnail picture to the right to see a larger picture of an open pontil. An iron pontil (also called an improved pontil or inaccurately a graphite pontil, though there is no actual graphite associated with an iron pontil) is a variation on the pontil theme and appears like a "smear" of gray or reddish deposit on the base. 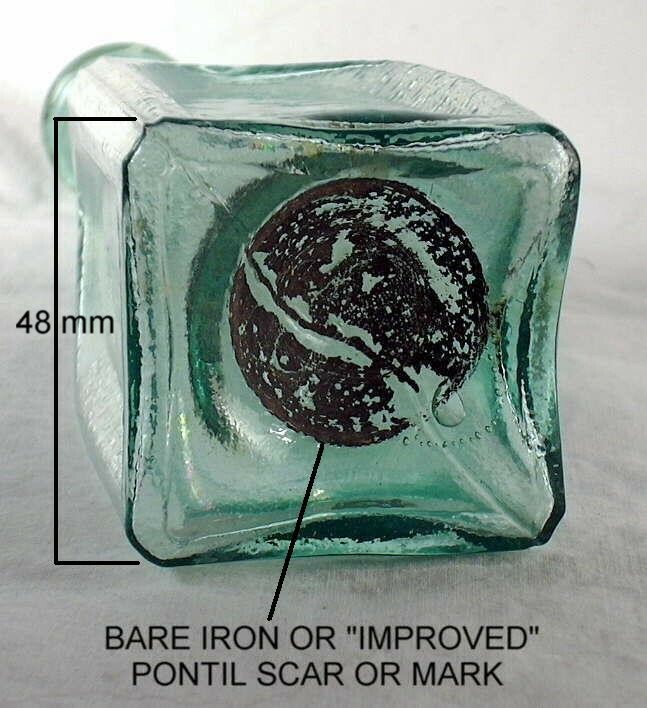 Sometimes the mark is faint and much or all of the iron is gone - especially if the bottle was "professionally cleaned" (described later). Common on soda & mineral water bottles, some flasks, and occasional medicinals from before the Civil War. Click on thumbnail picture to the left to see a larger picture of an improved pontil. Another pontil variation is the sand pontil which is a diffuse and sparse scattering of sand grain sized glass particles on the base - often found on bottles like Dr. Townsend's Sarsaparilla's, rectangular snuff bottles, and others. This was cased by dipping the hot glass tipped pontil rod into sand to keep the pontil rod from adhering too much to the bottle base. Mint: A truly "mint" bottle has no chips, cracks, scratches, or dings, and is also free of easily visible stain and case wear. 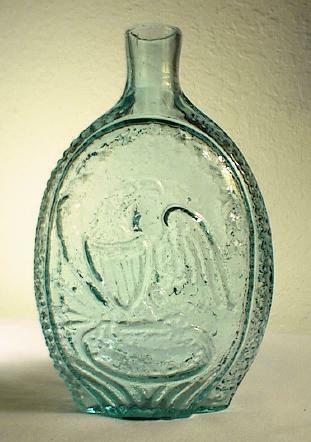 Light content residue (unless distracting) or base wear is not considered damaging in any way and bottles with these conditions may be described as "mint". About Mint: This starts to edge in to the murky world of bottle condition descriptions. The term "about mint" refers to any bottle with minor defects that do not significantly affect value. These defects may include (but are not restricted to) the following conditions: smaller pinhead (fleabite) flakes, small pontil chips, onion-skin open bubbles, minor neck crazing, minor scratching, spotty and/or faint haze (of the virtually un-noticeable variety), minor wear or scuffing and potstone radiations less than 1/16" in length. I will ALWAYS describe any potstone with ANY radiation, however. Every attempt will be made to clarify the reasoning behind describing an item as "about mint" and an exact explanation of ANY thing that keeps the bottle out of the pure mint category will be included in the description. Send me an email if any questions about any condition explanations I use in my bottle descriptions. Pontil Chip or Flake: This term refers to a flake or chip immediately adjacent to an open or glass-tipped pontil mark that occurred during manufacture, when the glassblower removed the pontil rod from the base of the bottle. I consider this defect to detract from value only when the flake is obtrusive and/or extends to the edge of the base and thus effects the visual appeal of the bottle. Crazing Lines: The lip finishing process often results in a small series of stress marks or "checks" in the upper neck that are referred to as "crazing lines." This in-manufacture condition is quite prevalent in aqua pontil medicines and early sodas. Crazing lines only significant detract from value of a bottle when they affect the visual esthetics of a bottle on display. As always, these will be described as well as I can. Bruise: The term "bruise" refers to a rainbow-like area of damage that generally results from contact with another object. I will use this language only to describe post-manufacture damage and the size and location of the bruise will always be included in the description. Pinhead Flake & "Fleabite": I will utilize the term "pinhead" in a literal fashion - any flake the same size or smaller than a pinhead (less than 1/16") will be called a pinhead nick with the location noted. A "fleabite" and "pin prick" are even smaller - just tiny nicks that would be less than 1/32". Anything larger...see next definition. Chip and Flake: Though these terms are often used interchangeably, I will attempt qualify any area of damage greater than 3/8" as a "chip" and anything smaller and thinner - but larger than a pinhead - as a "flake". Again, both terms will be used in conjunction with an exact indication of the size and location of the damage. All this effort to differentiate terminology for the size and type of chips seems a little AR, but most collectors know that the difference in value can be dramatic, so I want to be as accurate in my descriptions as possible. Burst Bubbles and Open Bubbles: Much of the attraction of early glass is attributable to air bubbles in the glass and as a result, I generally do not consider "open" or "burst" bubbles to be distracting if they are small, no greater than "onion-skin" in depth, or located on the interior of the bubble. More significant burst bubbles will be described with reference to the size, depth, and location. Some great bottles are so crude with hundreds or thousands of bubbles, that sheer probability dictates some will exist on the surface of the glass and adds to the bottles attractiveness. Haze and Stain: Like the terms "chip" and "flake", the words "haze" and "stain" are often used interchangeably but I will generally use "haze" to describe minor interior or exterior cloudiness that can be seen only upon close inspection and "stain" to refer to more serious discoloration. Most "haze" can be remedied by a professional tumble - "stain" will sometimes respond to cleaning though may leave behind some etching on the glass surface. "Water stain" refers to the milky white cloudiness inside a bottle that was typically caused by ground water laying in all/portion of the bottle for many decades prior to being exhumed for modern collector enjoyment. Scratching and Scuffing: I will speak of "scuffing" when describing light rub marks with little depth and minimal distraction, while "scratching" is generally more significant. Scratches will have discernable depth (i.e. can be felt when rubbing your fingernail over it), but both will be described using size and location. Ground Wear: Many of today's dug and cleaned bottles have minor ground imperfections on the exterior surface that include scratching, deeper scuff marks, pinhead body nicks, and light etching. These conditions are generally grouped together under the general heading of "ground wear" and this term will further be clarified by describing the wear as light, moderate or heavy. Ground wear is particularly common on cleaned early soda and mineral water bottles that were used and reused many times (aka "case wear"). Etching: I will use this term to describe stain that is embedded with the glass that will not be affected by a professional tumble without dramatically over cleaning the bottle. 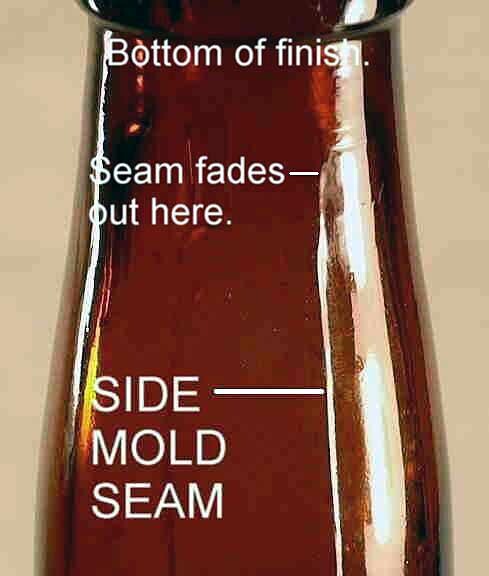 At times, cleaned bottles will have patches of "etching" on the interior that no longer appear "stained" though they are apparent upon close inspection. The differences between etching, ground wear, and case wear are often indistinguishable and I would use more than just the words to explain the "problem" - if it is a problem. Lightly Cleaned: With the advent of professional tumbling, many of the bottles on today's market have spent time in a cleaning machine. I will use the term "lightly cleaned" to describe a bottle that has been tumbled for a short time without softening the embossing or appreciably altering the glass texture. Bottles that have been more rigorously cleaned will be referred to as "moderately" or "heavily cleaned" (as the case may be) and can have the embossing damped and an obviously polished glass surface. In every case, I will do my best to indicate whether or not I believe a bottle has been "tumble" cleaned, though sometimes light cleaning is not possible to discern. This is a comprehensive - though still "draft" and incomplete - website devoted to the identification of American made bottles produced between 1800 and 1950. 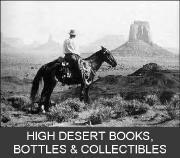 This new web based resource is being created by the author of this High Desert Antique Bottle & Medicinal Tonic Website for the Bureau of Land Management (my employer) and is intended to be a tool for bottle collectors, archaeologists, and the general public in identifying the type and approximate age of just about any bottle made in the U.S. or Canada during the period listed. The link above takes a viewer to the currently available draft pages. Be aware that many of the links on the completed pages are not enabled as yet. Even in its incomplete form the site contains a wealth of information that can help answer many of the bottle questions a viewer of may have. Go to the Historicbottles.com Homepage.